History: (Avengers I#346)- Starforce was gathered by the Supreme Intelligence during the Kree-Shi'ar War to serve as his agents against the Avengers. They were sent to apprehend the Avengers who had come to Hala hoping to seek a diplomatic solution, and engaged them in combat. Although the Avengers managed to hold their own, the battle ended when Deathbird slew Ael-Dan and Dar-Benn, the leaders of the Kree, resulting the Supreme Intelligence assuming leadership of the Kree again. The Avengers were all taken into custody. (Thor I#446)- Now joined by Ronan and recognized by the Empire, all of Starforce except for Atlas and Minerva were sent to the Shi'ar Throneworld to kill Lilandra. They were opposed there by the Avengers who had been meeting with Lilandra, and by the Imperial Guard. By working together, the two teams were able to defeat Starforce. (Avengers West Coast#82)- Lilandra sentenced Starforce to death, but the Avengers opposed this, and fought the Imperial Guard over them. After learning that the Skrulls had been manipulating part of the war, Lilandra set Ultimus free in the hopes that he could convince the Kree to help her end the war. (Avengers I#347)- Before peace could be reached, the Kree-Shi'ar war ended with the decimation of the Kree Empire. Captain Atlas and Dr. Minerva faked their deaths on Hala so that they could start a life together elsewhere. Lilandra assumed leadership of the Kree, and set Deathbird to rule the planet Hala, with Starforce as her own Imperial Guard, but Ronan and the Supremor no longer served as members of Starforce. 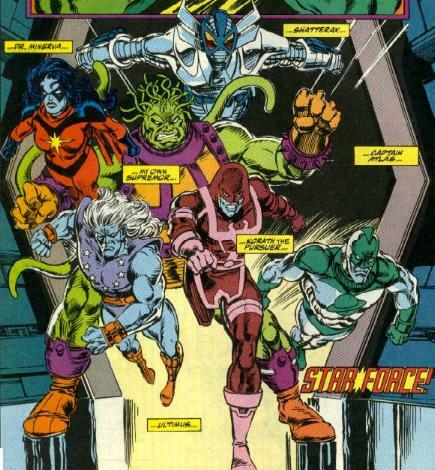 (Quasar#35)- Starforce intercepted Quasar and his allies Makkari and Her on Hala. Although the three heroes had come to assist Hala in rebuilding the planet, Deathbird did not believe them, and Quasar and his friends fled to avoid a pointless battle. (Silver Surfer: Breakout) - The prison breakout of Admiral Galen-Kor and his criminal cohorts gained the attention of Deathbird and her guards Starforce. While Ultimus and Supremor attempted to put down the revolt, Galen-Kor's allies took one starship apiece and fled the planet's atmosphere, with Deathbird, Korath, and Shatterax in hot pursuit. The battle was joined by the Silver Surfer, who had heard rumors of Hala's prison population overrunning the planet and came to put it down if true. He disabled one craft, but the other three escaped into 'hyperspace'. When Lilandra arrived she ordered Deathbird and the Starforce back to Hala to quell the revolt there while the Imperial Guard pursued the other escapees. (Blackwulf#7)- Following the path of destruction caused by Tantalus, Starforce came upon members of the Underground Legion, who were pursuing Tantalus. After a brief skirmish, Starforce offered their assistance, Ultimus in particular desiring revenge for when Tantalus buried him on earth. (Blackwulf#8)- Starforce and the Underground arrived on Armechadon, where they joined forces with the Underground of Armechadon against the armies of Tantalus. (Blackwulf#10)- Shatterax of Starforce joined members of the Underground in the final battle against Tantalus and his Peacekeepers, during which Tantalus was slain. (Annihilation: Ronan#1 (fb) - BTS) - When the Kree Empire regained its autonomy, the members of Starforce were branded defectors and forced to leave the empire. Comments: Created by Bob Harras, Steve Epting and Tom Palmer. The Starforce has an entry in Marvel Legacy: The 1990s Handbook.